CLASSICS BIOGRAPHIES ROSSEN MILANOV, conductor Respected and admired by audiences and musicians alike, Rossen Milanov is currently the Music Director of the Columbus Symphony Orchestra (CSO), Chautauqua Symphony Orchestra, Princeton Symphony Orchestra and the Orquesta Sinfónica del Principado de Asturias (OSPA) in Spain. In 2017, Milanov was a recipient of an Arts Prize by The Columbus Foundation for presenting Beethoven’s Ninth Symphony as part of Columbus Symphony’s 2017 Picnic with the Pops summer series. Under his leadership, the Symphony has expanded its reach by connecting original programming with community-wide initiatives such as focusing on women composers, nature conservancy, presenting original Festivals and supporting and commissioning new music. Milanov has established himself as a conductor with considerable national and international presence. He has appeared with the Colorado, Detroit, Indianapolis, Milwaukee, Baltimore, Seattle, Fort Worth symphonies, and National Symphony Orchestra at the Kennedy Center, Link Up education projects with Carnegie Hall with the Orchestra of St. Luke’s and Civic Orchestra in Chicago. Internationally, he has collaborated with BBC Symphony Orchestra, Orchestra de la Suisse Romand, Rotterdam Philharmonic, Aalborg, Latvian and Hungarian National Symphony Orchestras, Slovenain Radio Symphony Orchestra and the orchestras in Toronto, Vancouver, KwaZulu-Natal Philharmonic in South Africa, Mexico, Colombia, Sao Paolo, Belo Horizonte and New Zealand Symphony Orchestra. In the Far East he has appeared with NHK, Sapporo, Tokyo, Singapore Symphonies, Hyogo Performing Arts Center, Malaysian and Hong Kong Philharmonics. Milanov has collaborated with some of the world’s preeminent artists, including Yo-Yo Ma, Itzhak Perlman, Joshua Bell, Midori, Christian Tetzlaff, and André Watts. During his 11-year tenure with The Philadelphia Orchestra, Milanov conducted more than 200 performances. In 2015, he completed 15-years tenure as Music Director of the nationally recognized training orchestra Symphony in C in New Jersey and in 2013, a 17-year tenure with the New Symphony Orchestra in his native city of Sofia, Bulgaria. His passion for new music has resulted in numerous world premieres of works by composers such as Derek Bermel, Mason Bates, Caroline Shaw, Phillip Glass, Richard Danielpour, Nicolas Maw, and Gabriel Prokofiev, among others. Noted for his versatility, Milanov is also a welcomed presence in the worlds of opera and ballet. He has collaborated with Komische Oper Berlin (Shostakovich’s Lady Macbeth of Mtzensk), Opera Oviedo with the Spanish premiere of Tchaikovsky’s Mazzepa and Bartok’s Bluebeard’s Castle (awarded best Spanish production for 2015), and Opera Columbus (Verdi’s La Traviata). An experienced ballet conductor, he has been seen at New York City Ballet and collaborated with some of the best known choreographers of our time such Mats Ek, Benjamin Millepied, and most recently Alexei Ratmansky in the critically acclaimed revival of Swan Lake in Zurich with Zurich Ballet and in Paris with La Scala Ballet. Milanov studied conducting at the Curtis Institute of Music and the Juilliard School, where he received the Bruno Walter Memorial Scholarship. A passionate chef, he often dedicates his culinary talents to various charities. CLASSICS BIOGRAPHIES HANNAH LUDWIG, mezzo-soprano Mezzo-soprano Hannah Ludwig is a recent graduate of the Academy of Vocal Arts in Philadelphia, PA., where she performed the roles of Charlotte in Massenet’s Werther, Isabella in Rossini’s L’italiana in Algieri, Frugola in Puccini’s Il Tabarro, Siebel in Gounod’s Faust , Maddalena in Verdi’s Rigoletto, the Third Lady in Mozart’s Die Zauberflöte, and the Komponist in Strauss’ Ariade auf Naxos. For the Aspen Music Festival she has performed the roles of Ursule in Berlioz’s Beatrice et Benedict, and Sesto in Mozart’s La Clemenza di Tito conducted by Jane Glover. With Pacific Opera Theatre she has been seen as Meg Page in Nicolai’s The Merry Wives of Windsor, Third Lady in The Magic Flute, and Jenny Diver in Kurt Weill’s The Threepenny Opera. She made her role debut as Prince Orlofsky in Johann Strauss’ Die Fledermaus with Stockton Opera, and sang Ruggiero in Handel’s Alcina with NAPA Music Festival. Most recently Hannah made her Carnegie Hall debut in the Requiem for The Living, performed Handel’s Messiah with the Baltimore Symphony, and Mozart’s Requiem with the Columbus Symphony. She also debuted as Isaura in Rossini’s Tancredi with Will Crutchfield’s new festival Teatro Nuovo in the summer of 2018. Upcoming engagements include her Opera Philadelphia debut in Donizetti’s Lucia di Lammermoor, and Rosina in Rossini’s Il Barbiere di Siviglia with Annapolis Opera. Future engagements include Mahler’s 2nd Symphony with Flint Symphony, Pippo in La Gazza Ladra with Teatro Nuovo, and her debut with the Dallas Opera as 3rd Lady in Mozart’s The Magic Flute. Miss Ludwig has achieved numerous awards and recognitions through several competitions including; second prize in the Loren L. Zachary Vocal Competition in 2018. In the spring of 2016 she received encouragement awards from the Gulf Coast Regional of the Metropolitan Opera National Council Auditions, and the Licia Albanese-Puccini International Vocal Competition. She is a Grant Winner of the Giulio Gari Vocal competition and was a two-year finalist in the Tier II Category of the Inaugural James Toland Vocal Competition in Oakland, CA. CLASSICS BIOGRAPHIES DUAIN WOLFE, director, Colorado Symphony Chorus Recently awarded two Grammys® for Best Choral Performance and Best Classical Recording, Duain Wolfe is founder and Director of the Colorado Symphony Chorus and Music Director of the Chicago Symphony Chorus. 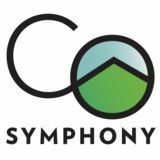 This year marks Wolfe’s 35th season with the Colorado Symphony Chorus. The Chorus has been featured at the Aspen Music Festival for over two decades. Wolfe, who is in his 25th season with the Chicago Symphony Chorus has collaborated with Daniel Barenboim, Pierre Boulez, Bernard Haitink, Riccardo Muti, and the late Sir George Solti on numerous recordings including Wagner’s Die Meistersinger, which won the 1998 Grammy® for Best Opera Recording. Wolfe’s extensive musical accomplishments have resulted in numerous awards, including an honorary Doctor of Fine Arts from the University of Denver, the Bonfils Stanton Award in the Arts and Humanities, the Governor’s Award for Excellence in the Arts, the Mayor’s Award for Excellence in an Artistic Discipline, and the Michael Korn Award for the Development of the Professional Choral Art. Wolfe is also founder of the Colorado Children’s Chorale, from which he retired in 1999 after 25 years; the Chorale celebrated its 40th anniversary last season. For 20 years, Wolfe also worked with the Central City Opera Festival as chorus director and conductor, founding and directing the company’s young artist residence program, as well as its education and outreach programs. Wolfe’s additional accomplishments include directing and preparing choruses for Chicago’s Ravinia Festival, the Bravo!Vail Festival, the Berkshire Choral Festival, the Aspen Music Festival, and the Grand Teton Music Festival. He has worked with Pinchas Zuckerman as Chorus Director for the Canadian National Arts Centre Orchestra for the past 13 years. Stevenson, Melanie Thayer, Mary B. Virtue, Pat Voland, Colleen York, Beth ALTO II Boothe, Kay A. Cox, Martha E. Daniel, Sheri L. Deck, Barbara Dominguez, Joyce Eslick, Carol A. Golden, Daniela Holmes, Kelsey Hoskins, Hansi Jackson, Brandy H. Janasko, Ellen D. LeBaron, Andrea London, Carole A. Maltzahn, Joanna K. Marchbank, Barbara J. Schalow, Elle C. Scooros, Pamela R. Trierweiler, Ginny Worthington, Evin TENOR I Dougan, Dustin Gordon, Jr., Frank Guittar, Jr., Forrest Hodel, David K. Jordan, Curt Moraskie, Richard A. Mosser, Shane Muesing, Garvis J. Nicholas, Timothy W. Rehberg, Dallas Reiley, William G. Roach, Eugene Thompson, Hannis Zimmerman, Kenneth TENOR II Babcock, Gary E. Bradley, Mac Carlson, James Davies, Dusty R. Dinkel, Jack Fuehrer, Roger Gale, John H.
Ibrahim, Sami Jin, Yi Kolm, Kenneth E. Lively, Mark McCracken, Todd Meswarb, Stephen J. Milligan, Tom A. Richardson, Tyler Ruth, Ronald L. Seamans, Andrew J. Shaw, Kyle Sims, Jerry E. BASS I Adams, John G. Cowen, George Drickey, Robert E. Gray, Matthew Hesse, Douglas D. Hunt, Leonard Jirak, Thomas J. Mehta, Nalin J. Quarles, Kenneth Ragan, Jimmy Ravid, Frederick Smith, Benjamin A. Struthers, David R. BASS II Friedlander, Robert Grossman, Chris Israelson, Eric W. Jackson, Terry L. Kent, Roy A. Morrison, Greg A. Nuccio, Eugene J. Phillips, John R. Potter, Tom Skillings, Russell R. Skinner, Jack Smedberg, Matthew Swanson, Wil W. Taylor, Don Virtue, Tom G.
CLASSICS PROGRAM NOTES PROKOFIEV: ALEXANDER NEVSKY I. Russia Under the Mongolian Yoke II. Song about Alexander Nevsky A i bilo dyelo na Nyevye ryekye —	na Nyevye ryekye, na bol’shoi vodye. Tam rubili mi zloye voinstvo —	zloye voinstvo, voisko shvedskoye. It happened by the River Neva — by the River Neva, by the great waters. There we slew the enemy warriors — the enemy warriors, the Swedish hordes. Ukh! Kak bilis mi, kak rubilis mi! Ukh! Rubili korabli po dostochkam! Nashu krov’ rudu nye zhalyeli mi	za vyelikuyu zyemlyu russkuyu. Ah! How we fought, how we routed them! Ah! How we smashed their ships to pieces! We freely shed our blood for our great Russian land. Gei! Gdye proshol topor, bila ulitsa,	Hey! We opened a street where our battleaxe was swung, gdye lyetyelo kopyo, pereulochek! we cut a lane where our spear was thrust! Polozhili mi shvedsov nyemchikov,	We mowed down the Swedish invaders kak kovyl’ travu na sukhoi zyemlye. like dry grass on desert soil. Nye ustupim mi zyemlyu russkuyu. Kto pridyot na Rus’, budyet na smyert’ bit! Podnyalasa Rus’ suprotiv vraga,	podnimis’ na boi, slavny Novgorod! We shall never surrender our Russian land. Those who march on Russia will be slain! Arise, Russia, against the foe, rise to arms, great Novgorod! III. The Crusaders in Pskov Peregrinus expectavi pedes A foreigner, I expected my feet to be meos in cymbalis ...	sandal-shod. IV. Arise, Ye Russian People Vstavaitye, lyudi russkie,	na slavny boi, na smyertny boi;	vstavaitye, lyudi vol’niye,	za nashu zyemlyu chestnuyu! Zhivym boitsam pochot i chest’,	a myertvym slava vechnaya! Za otchiy dom, za russkiy krai,	vstavaitye, lyudi russkie! Arise, ye Russian people, to a just battle, a fight to the death; arise, ye people brave and free, to guard our beloved native land. High praise to living warriors, immortal glory to slain warriors! For our native home, for our Russian soil, arise, ye Russian people! CLASSICS PROGRAM NOTES Na Rusi rodnoy, na Rusi bol’shoi,	In our native Russia, our great Russia, nye byvat’ vragu. no foe shall live. Podnimaisa, vstan’, mat’ rodnaya Rus’! To arms, arise, mother Russia! Vragam na Rus’ nye khazhivat,	No foe shall march upon Russian land, polkov na Rus’ nye vazhivat’,	no foreign troops shall raid Russia, putyei na Rus’ nye vidyvat’,	the ways into Russia will not be revealed to them, polyei Rusi nye taptyvat’. they shall not ravage Russian fields. V. The Battle on Ice Peregrinus expectavi pedes	A foreigner, I expected my feet meos in cymbalis ... est! to be cymbal-shod! Vincat arma crucifera! Victory to the arms of the cross-bearers! Hostis pereat! Let the foes perish! VI. The Field of the Dead Ya poidu po polyu byelomu,	polyechu po polyu smyertnomu. Poishchu ya slavnykh sokolov,	zhenikhov moikh, dobrykh molodtsev. I shall go out across the snow-covered field, fly above the field of death. I shall search for those glorious warriors, my betrothed, my noble youths. Kto lyezhit, myechami porublyenny,	kto lyezhit, streloyu poranyenny. Napoili oni krovyu aloyu	zyemlyu chestnuyu, zyemlyu russkuyu. Here lies one felled by a sword, here lies one pierced by an arrow. Their blood fell like rain on our beloved land, our Russian land. Kto pogib za Rus’ smyertyu dobroyu,	He who died so nobly for Russia, potseluyu tovo v ochi myortviye,	I shall kiss his dead eyes, a tomu molodtsu, shto ostalsa zhit’,	and to the brave youth who lives budu vyernoi zhenoi, miloi ladoyu. I shall be a faithful wife and a loving companion. Nye voz’mu v muzhya krasivovo:	krasota zyemnaya konchayetsa. A poidu ya za khrabrovo. Otzovityesa, yasny sokoly! I’ll not wed a man who is handsome: earthly beauty soon fades. But I shall marry a brave man. Hear this, brave warriors! CLASSICS PROGRAM NOTES VII. Alexander’s Entry into Pskov Na vyeliki boi vykhodila Rus’. Voroga pobyedila Rus’. Na rodnoi zyemlye nye byvat’ vragu. kto pridyot budyet na smyert’ bit! Russia went forth in a great campaign. Russia has defeated the invaders. No enemy shall live in our native land. Our foes will meet their death! Vyesyelisa, poi, mat’ rodnaya Rus’! Na rodnoi Rusi nye byvat’ vragu. Nye vidat’ vragu nashikh russkikh syol:	kto pridyot na Rus’, budyet na smyert’ bit! Rejoice and sing, mother Russia! No enemy shall live in our Russian land. Foes shall not set eyes on our Russian towns: those who attack Russia shall be put to death! Na Rusi rodnoi, na Rusi bol’shoi,	nye byvat’ vragu! Vyesyelisa, poi, mat’ rodnaya Rus’! Na vyelikiy prazdnik sobralasa Rus’. Vyesyelisa, Rus’, rodnaya mat’! In our native Russia, our great Russia, no enemy shall live! Rejoice and sing, mother Russia! All of Russia gathered for the celebration. Rejoice, Russia, our motherland! CLASSICS PROGRAM NOTES ALEXANDER BORODIN (1833-1887): “Polovtsian Dances” from Prince Igor Alexander Borodin was born on November 12, 1833 in St. Petersburg and died there on February 27, 1887. He composed Prince Igor in 1869-1887 and the opera was premiered on November 4, 1890 in St. Petersburg, conducted by Karl Kuchera. The score calls for two flutes, piccolo, two oboes, English horn, two clarinets, two bassoons, four horns, two trumpets, three trombones, tuba, timpani, percussion, harp and strings. Duration is about 12 minutes. 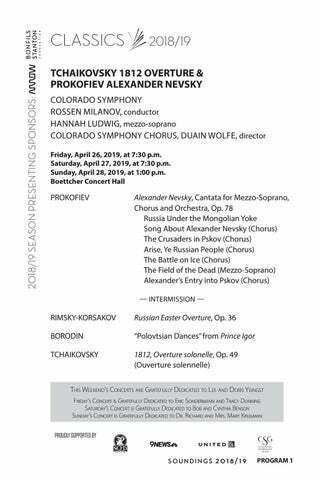 The piece was last performed on October 22-24, 2010, with Alexander Polianichko leading the orchestra. In Borodin’s opera, Igor is captured while trying to rid Russia of the Polovtsi, an invading Tartar race from Central Asia. The leader of the Polovtsi, Khan Kontchak, treats Igor as a guest rather than a prisoner, and entertains him lavishly. Khan offers him his freedom if he will promise to leave the Polovtsi in peace, but Igor refuses. Igor nevertheless effects his escape and returns triumphantly to his people. Borodin wrote that Prince Igor is “essentially a national opera, interesting only to us Russians, who love to steep our patriotism in the sources of our history, and to see the origins of our nationality again on the stage.” To make his opera as authentic as possible, he studied the music, history and lore of Central Asia, where the opera is set, and sought out travelers with first-hand knowledge of the region. His colorful, “Oriental” writing for the Polovtsi was influenced not only by authentic Caucasian melodies, but also by music from the Middle East and North Africa. The Polovtsian Dances are the centerpiece of the Khan’s entertainment for Igor in Act II. A brief introduction opens the scene in the Polovtsian camp with an arch-shaped theme played quietly by flute and clarinet. The first dance, whose beguiling melody was transformed into the song Stranger in Paradise in the 1953 Broadway musical Kismet, accompanies the procession of captives. The women of the chorus sing its text, a tender song extolling the high mountains and blue skies of their Polovtsian homeland. Next comes the entry of the Polovtsian warriors to solid, rough music led by the Oriental wailings of the woodwinds and a sturdy version of the arched theme from the introduction. A timpani solo introduces a ferocious general dance in which the chorus, accompanied by full orchestra, sings the praises of the mighty Khan. The next dance, with its galloping rhythm, its persistent descending four-note motive and its continuing adulation of the Polovtsian ruler, accompanies the war games of the savage young men. The swaying melody of the first dance returns in a richer setting and is soon combined with the energetic theme of the savage warriors. The rough music and Oriental wailings that introduced the warriors return with a ferocious vehemence to bring the brilliant Polovtsian Dances to a rousing close. Fly on the wings of the wind to our native land, you folksongs; to the place where we sang in freedom, where we existed so simply. CLASSICS PROGRAM NOTES Tam, pod znoynym nebom,	negoy vozdukh polon;	tam, pod govor morya,	dremlyut gori oblakakh. Tam tak yarko solntse svetit,	Tam tak yarko ...	rodnye gory svetom ozaryaya;	... solntse	v dolinakh pyshno rozy rastsvetayut,	... tam roza	i solovy poyut v lesakh zelyonykh	... tsvetyot	... poyut v lesakh. I sladky vinograd rostyot. Tam tebe privolney, pesnya,	ty tuda i uletay. Poyte pesni slavy khanu! Sing songs in praise of the Khan! Poy! Sing! Slavte silu, doblest khana! Praise the measure of our Khan’s glory! Slav! Praise! Slaven khan! Hail the Khan! Khan! The Khan! Slaven on, khan nash! He is glorious, our Khan! Bleskom slavy solntsu raven khan! The Khan’s glory is like unto the sun’s rays! Netu ravnykh slavoy khanu! Nothing equals the glory of our Khan! Net! No! WOMEN’S CHORUS Chagi khana, chagi khana ...	... slavyat ...khana ...	... slavyat khana svoevo,	slavyat khana. CLASSICS PROGRAM NOTES Kto zhe slavy raven khanu? Kto? Bleskom slavy solntsu raven on! Slavoy dedam raven khan nash	khan, khan Konchak! Slavoy dedam raven khan nash,	khan, khan Konchak! Grozny khan, khan Konchak! Slaven khan, khan Konchak! Slaven khan, khan Konchak! Khan Konchak! Slaven khan, khan Konchak! Khan Konchak! CLASSICS PROGRAM NOTES TCHAIKOVSKY: 1812 OVERTURE Spasi Gospodi, liudi Tvoia,	i blagoslovi dostoianie Tvoie. Pobedy boriushchimsia za veru pravuia i sa sviatuiu rus,	nasoprotivnyia daruia. I Tvoie sokhraniaia	krestom Tvoim zhitelstvo. Grant salvation to Thy people, Lord, and we pray Thee, bless Thine inheritance, O God. Grant victory to those who fight to save righteous faith and our dear sacred land, and from all evil deliver them. Then the guardian of Thy grace the Cross will forever be. U vorot, vorot batiushkinykh,	ai, dunai, moi dunai,	ai, veselyi dunai. U vorot, vorot novykh matushkinykh,	ai, dunai, moi dunai	ai, veselyi dunai. At the gate, the gate to fatherâ&#x20AC;&#x2122;s dear house, ai, dunai, my dunai, ai, sing we all dunai. At the gate, the gate to motherâ&#x20AC;&#x2122;s dear house, ai, dunai, my dunai, ai, sing we all dunai. Spasi Gospodi, liudi Tvoia	i blagoslovi dostoianie Tvoie. Pobedy boriushchimsia za veru pravuia i sa sviatuiu rus,	i blagoslovi dostoianie Tvoie. Grant salvation to Thy people, Lord, and we pray Thee, bless Thine inheritance, O God. Grant victory to those who fight to save righteous faith and our dear sacred land, and we pray Thee, bless Thine inheritance, O God. Bozhe tsaria khrani,	silny, derzhanvy,	tsarstvui na slavu,	tsarstvui na strakh vragam. God save our gracious Tsar, valiant and righteous, reigning in glory, reigning against his foes.